Check out answers to some of the most commonly asked questions for the London Congestion Charge? 1) I don’t have AutoAlert, can you tell me whether I entered the London Congestion Charging Zone? AutoAlert is not affiliated with Transport for London and does not have access to their systems. If you don’t have one of our GPS Tracking Devices or our London Congestion Charging Zone Application, then I’m afraid we cannot see whether you entered the London Congestion Charging Zone. For more information on Transport for London and their contact details, please check the TFL Congestion Charge website. 2) Can I Pay the Congestion Charge via the AutoAlert Congestion Charge App? Yes, you can pay via our app by clicking on the orange banner at the top of the Check Zones page. You can then select to pay by phone in which case we will connect you to the Transport for London call-centre or you can pay by text if you have an account registered with Transport for London. To pay by text, you will first need to register with Transport for London. Please note: AutoAlert does not process any payments or charge any fee for processing the payment. We simply send you on to the Transport for London call centre. Please be careful when dealing with the Congestion Charge as a number of fake websites have been set up which try to pass themselves off as TFL to charge a premium for processing your congestion charge. 3) I’ve heard about Unofficial Sites pretending to be TFL, are you one of them? 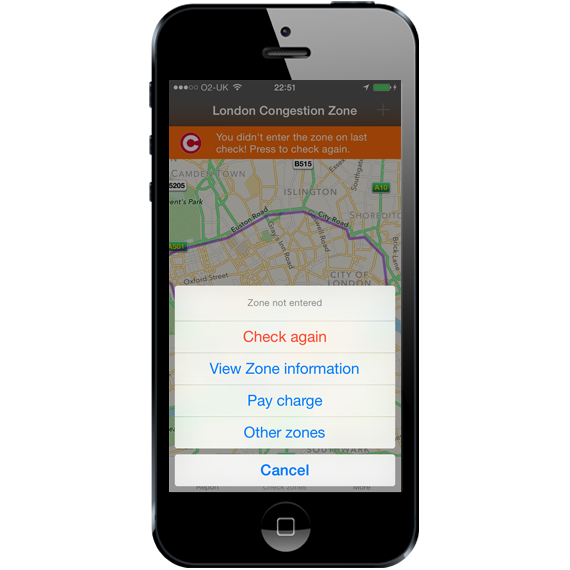 No, our London Congestion Charge Check and Remind application is a simple application which lets you check whether you are in the London Congestion Charging Zone, connects you to the TFL call centre so you can make a payment or create a reminder so you don’t forget to pay. Find out more about our London Congestion Charge Check and Remind Application. Find out more about unofficial websites passing themselves off as TFL. 4) How Does Your London Congestion Charge Check and Remind App work? Check whether you are in the London Congestion Charging Zone (and other zones). You can set a reminder so you don’t forget to pay. You can view your history, see when you entered the zone and when you attempted to make a payment. Additional information about the London Congestion Zone is available for quick reference. 5) What Device can I use to check whether I am in the Zone? To check whether you are in the Zone, you can use our London Congestion Charge Check and Remind application or one of our GPS Tracking Devices. If you have a subscription with AutoAlert, then you can also use any smart phone to check whether you are in the zone. Simply log in to your account on your phone in the normal way and then press Track. This will send your location to the AutoAlert system. If you have the Zone set up along with device alerts for your phone, then you will get an alert showing when and where you entered the zone. View and Create areas from the radar screen. Click set device alerts, and make sure your phone is selected to alert when it enters the Zone. For more information about setting up virtual areas, check out our support page. For more information about our Congestion Charge Check and Remind application, visit http://www.nocongestionchargefines.com. Our London Congestion Charge Check and Remind application is available to download from the iTunes store.